This week, I am featuring the amazing and very inspiring Jules Galloway. Jules is a Naturopath and the creator of some amazing recipes. I have been following Jules for quite some time now and I love seeing all the yummy and healthy recipes that she creates. I live near Byron Bay with my husband James, our two elderly rescue labradors, and one very old cat. I grew up in Melbourne in a white bread, weetbix, and meat-and-three-veggies household. I was always sick with annoying health conditions like tonsillitis, eczema, bronchitis, glandular fever and chest infections. It wasn’t until I was in my 20s that I was diagnosed with food intolerances – by this stage I was suffering with anxiety, fatigue and endometriosis. I did a massive detox, and then cut out wheat, dairy and sugar. My health improved in leaps and bounds! I became a naturopath because I was frustrated with the conventional medical system, its limitations, and its band-aid solutions, and I really wanted to help others to heal their bodies in the non-invasive way that I had. Try to relax. There’s no need to strive for perfection straight away. Don’t get stressed if you fall off the wagon and eat a piece of bread, or cake, or whatever. But take note of how it makes you feel afterwards – this might be enough to make you think twice next time. Become conscious of which foods make your body feel good, and which ones don’t. Eat more of what serves you. Experiment with new flavours and recipes so that you don’t feel deprived. I love farmers markets – you can find fresher produce there for less money. Food co-ops are another awesome way to buy organic food at very reasonable prices (plus they’re a great way to meet like-minded people!). What advice would you give to parents who are experiencing food struggles from their children? Keep trying. Sometimes kids will refuse a particular food several times, and then give it a go out of the blue. Hide greens in their smoothies. Sneak grated veggies into recipes wherever you can. Get them involved with cooking meals or even growing the veggies. Create a sense of enjoyment around food and meal times. Food should be a celebration! Oh, I have soooo many! I love love love seafood. For me, there’s nothing better than a big, fresh platter of prawns, lobster tails, oysters, scallops, and mussels. I also love any sort of antipasto – olives, pickles, cured meats and a little bit of goats’ or sheeps’ milk cheese. 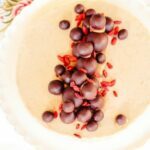 And then there’s the raw desserts – they are my all time favourite thing to make. Hence the raw high tea events that I’ve created! I love sharing my desserts with the world. Can I have more than one? I love The Merrymaker Sisters, Dan Churchill, Luke Hines and Lola Berry. I also love blogs like My New Roots, Vegie Head and Fragrant Vanilla Cake. I often get my inspiration from vegan and vegetarian peeps and then just add some meat, haha! I’m addicted to moving my body! I surf, do yoga, play beach volleyball, and have just taken up roller derby. It’s possible I’m having some kind of sporting mid-life crisis! My favourite at the moment is my Epic Raw Banoffee Cheesecake. There’s a fair few ingredients, but it’s actually really easy to make. Using a food processor with an “S” blade, process the macadamias and desiccated coconut until they resemble a fine biscuit-like crumb. Add 1 tsp of the coconut oil and process until slightly sticky. If the mixture is not coming together, add the other tsp of coconut oil and process again. Press the mixture into the bottom of a 22cm springform tin. Slice your banana lengthways into thin strips, brush with lemon juice, and then lay them on top of your base, so that it’s fully covered. Next, pop all the ingredients for your filling into a high speed blender (or food processor) and blend until silky smooth. Pour over the banana layer, tap the tin gently to remove any air bubbles, cover and pop into the freezer for 2 hours. To make the choc balls, use a food processor and process the almonds until they reach a fine powder. Add the dates, cacao butter and coconut nectar and process until it becomes a fudge-like consistency. Roll into balls of various sizes, ranging from 1cm to 3cm in diameter. Once the cheesecake has set hard, make the toffee sauce. Blend or process your almonds until they reach a nut butter-like consistency. Add all other ingredients and blend until smooth. Spoon or pipe dollops of the toffee sauce onto the cake, and use it to stick the choc balls in place. Garnish with goji berries and edible flowers. Keeps in the freezer for up to 6 weeks. Defrost for about 15-20 mins prior to serving. Jules Galloway is a passionate naturopath, blogger, beginner surfer and recent sea-changer, living just 10 minutes from Byron Bay. She specializes in gluten, dairy and sugar free living, and is dedicated to helping people make a smooth transition to healthy eating. 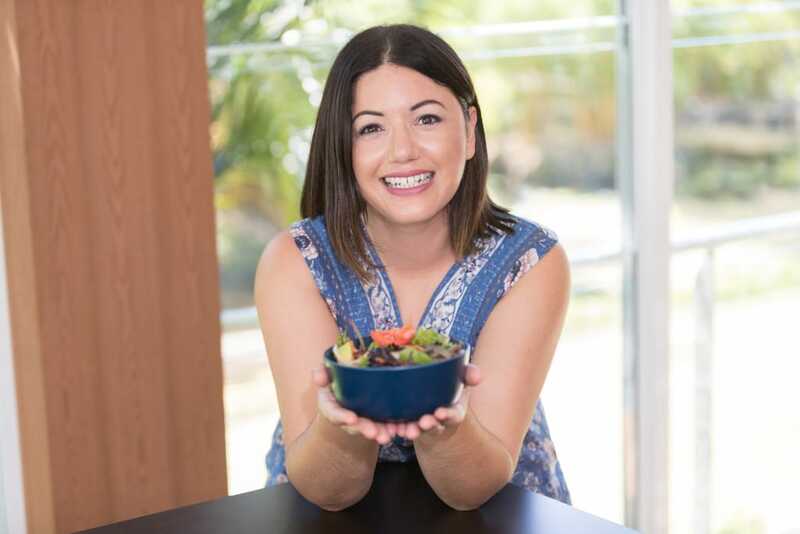 She holds Raw High Tea events around the country and has recently launched a successful 12 week program for fatigued women called Shiny Healthy You. Check out her fabulous recipes at http://julesgalloway.com or follow her on Facebook and Instagram.